SANTA BARBARA, CA (January 10, 2017) — At least 15 people have been killed in the devastation of the mudslides in Montecito, an unincorporated community in Santa Barbara County. At least 100 houses have been totally destroyed and more than two dozen people injured after an overnight rainstorm dropped a deluge of nearly six inches of rain early Tuesday morning. Ian Noyes, pastor of Montecito Covenant Church, said a number of members and attendees live in the area. Like the larger community around them, many did not recognize the fullness of the danger and chose not to evacuate. Noyes said these decisions were likely due to evacuation fatigue after recent wildfires. People were hesitant to leave their homes, he said, especially as evacuation can result in being displaced for up to two weeks. 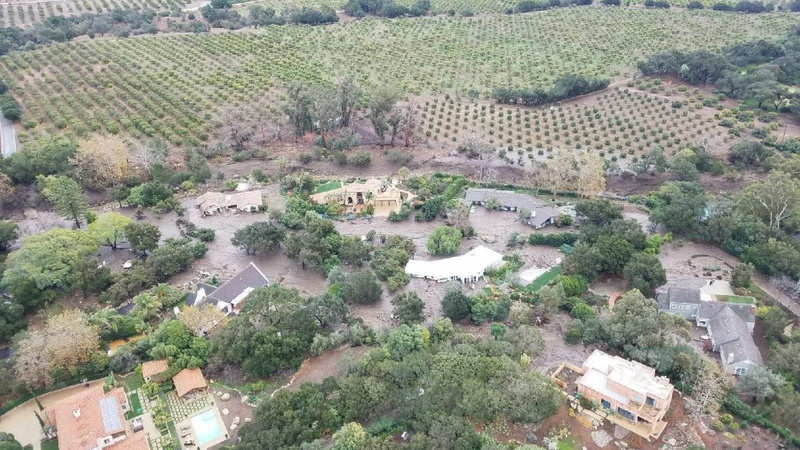 While no injuries have been reported among members or staff of Montecito Covenant, several members of families connected to the church are still unaccounted for, including children who attend the church’s youth programs. Some families in the church community have lost their homes, and others don’t know the state of theirs. The church’s buildings and ground, as well as the facilities of nearby Westmont College, were spared damage. Located just outside of the mandatory evacuation zone, the church will hold a prayer vigil tonight. “People need a place to respond,” said Noyes. Pastors and counselors will be on hand and available to talk to anyone seeking pastoral care. The New York Times reports that five highways remain closed on Wednesday, including California Highway 101, the major freeway serving the Santa Barbara area. Officials are working to haul away trees, boulders, downed power lines, debris, and, congealing over it all, a thick layer of mud. All Amtrak service between Oxnard and Santa Barbara has been suspended pending repair of damaged tracks. The California Department of Transportation estimates that some road closures may reopen late on Wednesday, but most will take at least several days. According to the Santa Barbara County sheriff, more than 600 people were still missing on Wednesday afternoon, and authorities are working to identify those who could be isolated in still-unreachable areas. The Los Angeles Times reports that some families continue to frantically look for loved ones who might still be missing, and the missing people and fatalities are weighing heavily on the community. The scene of the disaster, a vast area northwest of Los Angeles, was recently devastated by the state’s largest wildfire on record.